Elgood’s QE Cherry Wheat beer has scooped overall gold in the bottled & canned beer competition at the 2018 SIBA East Independent Beer Awards. The awards, run by the Society of Independent Brewers (SIBA), were held at Elgood’s before this years’ beer festival opening, and are judged by brewers and beer experts. The finals of SIBA will be held in Liverpool next year. See the full article by John Elworthy in the Wisbech Standard. 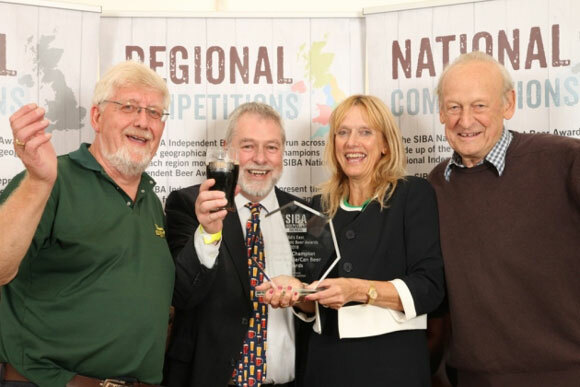 Guy Shephed of SIBA (second left) with head brewer Alan Pateman, Nigel Elgood (right) chairman and Belinda Sutton, managing director of Elgood’s. Photograph courtesy of Wisbech Standard. The competition, in which four other Elgood’s products also won awards, took place immediately before the opening of the three-day Elgood’s beer festival. The “not for profit” festival featured over 150 beers from independent craft breweries and was attended by around 1,000 visitors. There was live music each night from local bands “Toadfish Bone”, “The Cherry Reds”, “Bewildered” and “The Rusty Relics”.